Nursery: Admission is open to nursery class for both boys and girls who have completed 3 years as on 1st April of the academic year. notified on the notice board. The admission form should be completely filled in neat hand writing. a. Date of birth Certificate produced from the concerned authority /village pradhan/military authority as the case may be. b. Progress Report from the previous School. from the school in which the child was studying must accompany the admission form. * In case the student fails for the two consecutive years, he may be asked to withdraw. * Those students who are withdrawn or expelled from the School on disciplinary grounds will not be re-admitted. 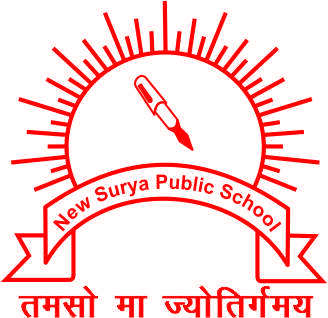 The general rules of New Surya Public School. 1. Honesty, Politeness, Courtesy, cleanliness, silence, attentions to work and respect of teachers and elders. 2. Silence must be maintained at all places during teaching hours. 3. Students are urged to speak in English in the school premises. 4. The School does not accept responsibility for the loss of books and property of the students. 5. Students at all costs must avoid writing or carving on walls or furniture. 6. The principal may punish a student for habitual idleness, disobedience or misconduct injurious to the moral tone of the school. All the parents are advised to follow the below rules regarding the fee submission. 1. Fee must be paid by the prescribed date in the school office, failing which is a fine will be charged till the end of the month accordingly. 2. If the fee is not paid by the last working day of the month, the name of the student maybe struck off the school register. 3. No exemption or deduction in fee will be made on account of local periods, holidays or absence due to any cause. 4. Monthly fee in cash will be accepted in the school office on all working days during the working hours. 5. Dues defaulter students may not be allowed to appear for the examination and report card will not be given unless all dues have been paid. 1. A minimum attendance of 75% of the working days is required for promotion. Students should come in time for the general assembly. 2. No student should leave the school premises during the school hours without the permission of the Principal which is granted on a written request of Parents. without sanction will have their names struck off the rolls. more than seven days, the Principal must be informed. students liable to be sent home. the rolls without any notice. If readmitted he will have to pay the full admission fee. Parents are advised to read this note for their children. their children to school in proper uniform. 3. Parents are expected to sign the diary to show their acknowledgment, sent for it. Failure to do so may put their children to great inconvenience. 4. When communication with the principal, parents/guardians are requested to mention in their letter the name of the student, class and section. 5. Parents/Guardians’ may be permitted to meet their children or meet the teacher during school hours with the permission of the Principal. 6. Tipping the servants either during or after school hours must be avoided at all costs. in the interest of their children. 8. Parents are requested to send their wards lunch along with him/her. Lunch should be sent by parents only. 9. Parents are requested to pick their child themselves else others /unknown person will not be allowed to take the child with them. The Principal reserves the right to add or change the rules contained in this book without assigning any reason for his action.